Former UW standout Damon Huard started 18 games at quarterback when Solari was the offensive coordinator of the Chiefs in 2006-07. Seahawks Hall of Famer Walter Jones played for him his last season in Seattle. 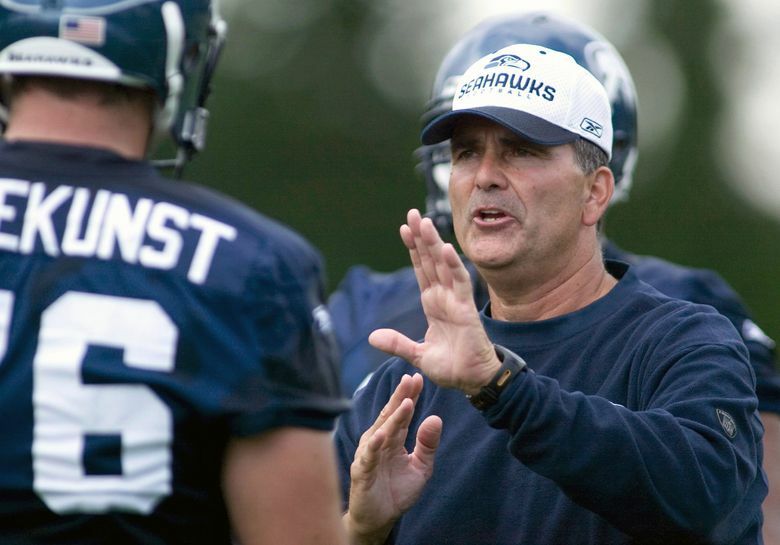 Those looking for clues for what new Seahawks’ offensive line coach Mike Solari will bring to the team have plenty of evidence to mine through — he’s been an assistant in the league for all but two seasons since 1987 when he was an assistant at Alabama. Two of the thousands of players the 63-year-old Solari has coached are two of the bigger-names in local football history — Hall of Famer Walter Jones, who played for Solari during his last season in Seattle and the NFL in 2008, and former UW standout QB Damon Huard, who started 18 games at quarterback when Solari was the offensive coordinator of the Chiefs in 2006-07. Each praised the hiring of Solari to replace the fired Tom Cable during interviews Thursday at the annual Morris Trophy award presentation, Jones stressing the ability of Solari to hold players accountable. “I tell a lot of people now that this is a guy who is going to demand that you go out there and be accountable for your work,’’ said Jones, who was the guest speaker at the event. Jones played 12 games under Solari in 2008 before suffering a left knee injury that would ultimately lead to the end of his career. He was with the Seahawks in 2009, Solari’s second year with Seattle, but did not play any games before announcing his retirement at the end of the season. Solari was hired by the Seahawks in 2008 after being fired by the Chiefs as offensive coordinator in 2007. Solari was the OC for the Chiefs for the 2006-07 seasons — the only two years he has been an OC in the NFL — getting the job due in large part to the credit he earned during his stint as the team’s offensive line coach from 1997-2005 when the team annually had one of the best lines in the league powered by future Hall of Famers Willie Roaf and Will Shields. Huard became the team’s primary starting quarterback in 2006 due to an injury to Trent Green, with the team then trading Green after the season, going with Huard and Brodie Croyle under center in 2007. Solari’s OC stint in KC was a tale of two seasons. It started promisingly as the Chiefs went 9-7 in 2006 and qualified for the playoffs behind one of the best running games in the NFL – Larry Johnson was second in the league in rushing with 1,789 yards and the Chiefs were third in rushing attempts, ninth in rushing yards and 27th in passing attempts. What the team also had in 2006 was two of the best guards in the NFL Shields and Brian Waters. Shields, though, retired after the 2006 season (Roaf, a right tackle, had retired after the 2005 season) and Johnson got hurt midway through and the offense fell apart. Kansas City finished 4-12 and rushed for just 1,248 yards — the Chiefs’ lowest season total in a non-strike year in franchise history — leading to then-head coach Herman Edwards’ decision to shake up the coaching staff and fire Solari at the end of the year. The inability to run it well meant that the Chiefs were just 30th in rushing attempts that season and 11th in passing attempts, almost a complete reversal of the previous season. It remains unclear exactly how much of an influence Solari will have in the overall construction of the offense. As Huard noted, Solari wanted an offense focused on the run in 2006. But the Chiefs had no choice but to pass it more the next year when the running game didn’t work. Solari will now work with new Seahawks offensive coordinator Brian Schottenheimer, whose greatest success in nine previous years as an OC was with the New York Jets in 2009-10 when the team advanced to the AFC title game each year behind a running game that ranked among the top four in the NFL. Given Seattle coach Pete Carroll’s comments after the season about getting back to the team’s previously successful formula of using a dominant running game and defense to win, the assumption is Solari and Schottenheimer are being brought in to try to replicate the running game success they have had elsewhere. When Solari came to Seattle in 2008 he installed a scheme focused on zone blocking, which the Seahawks have continued to use under Carroll and Cable. But Solari has ample experience with both man- and zone-blocking schemes and Jones says any focus on the scheme somewhat misses the point. Jones said he agreed with what receiver Doug Baldwin said after the season that it wasn’t so much the coaching but just the players not executing. Jones said one of the biggest changes for next year’s line could also be getting a full year out of veteran Duane Brown, who was acquired at mid-season in 2017.